Evidence exists linking genetic factors to a variety of speech and language difficulties. Recent studies of molecular genetics and neuroimaging are cross-disciplinary, combining forces between speech-language pathologists, physicians, and scientists. Researchers have already identified over 400 genes linked to hearing loss, and ongoing studies investigate genetic links to stuttering, voice disorders, and language disorders. A speech and language evaluation is a normal avenue to pursue when parents or caregivers suspect difficulty with communication. Anticipation of a speech and language evaluation can bring on feelings of stress if you aren’t sure what to expect, and meeting a new health-care professional in an unfamiliar office space can be overwhelming. Learn some general terms used by Speech Language Pathologists that will help you during your therapy visit. Children ages 3-5 are considered to be preschool-age. During this time, it is important to lay a strong foundation of language and literacy skills. Early exposure to a variety of language concepts and literacy themes can prepare your child for success in preschool and ensure they have adequate time to master skills that will help them to thrive in kindergarten. A lisp is one of the most common articulation errors targeted in speech-language therapy. It is a sound substitution or distortion in which the “s” and “z” sounds are produced inefficiently. Sing a Song to Boost Language Development! Encouraging your child to speak may lead to frustration for both you and your child. The most beneficial and fun ways to work with your child on using words can be during your daily routines. What does your child love to do with you? Singing and rhyming is a unique way to engage children in routines with built-in opportunities for communication. My one year old hasn’t said their first word yet. Should I be concerned? It is true – a child’s first words are typically formed around the age of one. Common first words include names of familiar people, favorite foods or toys, common verbs, ‘yes/no’ and ‘please.’ However, not all children begin using words by their first birthday. There are a couple of things to consider if you or your pediatrician are keeping a watchful eye on your child’s communication skills. By the age of one, your child should have certain skills that will help him/her transition into verbal communication. Communicating can be frustrating for both parents, and toddlers! Toddlers often know what they want, but are not yet able to express their wants accurately to caregivers. 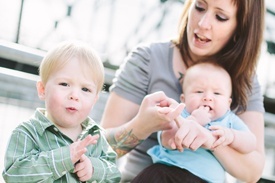 Communication breakdowns happen when toddlers point or whine, sending an unclear message to the adult they’re communicating with.